are sometimes called lifts, elevators, platforms, drawbridges, etc. I've included a PCX file (DEUGP3.PCX) with this section of the guide. completed level we will build in this lesson. Line know which door to open? Good question, grasshopper! to trigger has the same number for it's LineDef tag. into Sector mode. Select the Sector that has our door in it (#1). the switch is. In Line mode, select the Line, and hit Enter to modify it. a tripwire that opens the door. "What's a tripwire? ", you may ask. pylons had nothing to do with it, they're just there as a visual clue). at ground level. Got it? Good! split it into four sections, just like we did with the east wall Line. something like Figure 1 of the PCX file included with this lesson. SideDef and a 2nd SideDef, but no textures assigned to either one. You should also make the 1st and 2nd SideDef sector references Sector #0.
techniques a workout. When you get back, we'll tackle movable Sectors. the room. Choose a rectangular object, with a width and height of 64. 64, and ceiling height of 128. Give the Sector a LineDef tag of 50. Mark all four of the Lines again, and give them 1st SideDef lower textures. Don't give them upper or normal textures, or any 2nd SideDef textures at all. Figure 2 shows this new Sector added to our room. a chainsaw Thing on top of our newest Sector, and try the level out! tag of 60, and a 1st SideDef lower texture. This makes the Sector a lift that lowers when the player walks off it. the player leaves the lift, it will lower again. See Figure 3 for this. the right flavor to your own personal DOOM levels. Have fun! Soon to come: Part 4 - Pits, Windows, and Stairs. the Lines and Sector go away, but I don't think DEU completely deletes them. if you find something new, let the DOOM DEU-ers of the world hear about it! 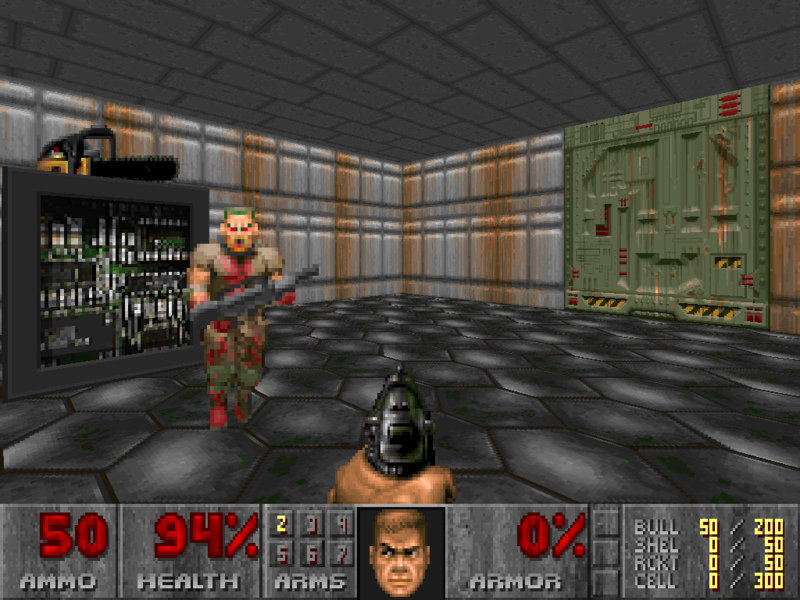 DOOM is a trademark of, and is Copyright (c) 1993, by id Software, Inc.